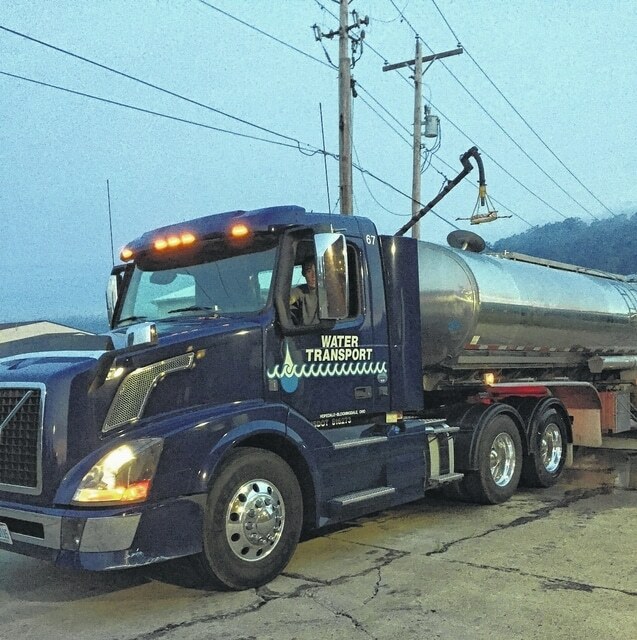 Trucks were called from various locations Wednesday and Thursday to transport water from the Gallipolis Water Treatment Plant to a Toyota plant in Buffalo, W.Va. due to a water main break there. Some of the largest trucks are capable of carrying 6,500 gallons of water. The arm above the truck container provides the means of delivering water for hauling. GALLIPOLIS — A water main break in Dunbar, W.Va., has prompted an automobile manufacturer there to request fresh water from the City of Gallipolis. The Toyota plant in Buffalo, W.Va., has been without water since Tuesday when the water main broke in nearby Dunbar, prompting local truckers to start transporting liquid to the facility from the Gallipolis Water Treatment Plant. According to media reports, a 36-inch water main broke Tuesday evening that has left Putnam County and Kanawha County residents and businesses without water. A second leak was discovered Thursday morning in the same break location. The Toyota plant, a facility operated by 15,000 employees, contacted the Gallipolis Water Treatment Plant for emergency water supplies, according to Brent McCreedy, water treatment plant supervisor. “The big trucks are mainly coming from the Zanesville area to haul our water. We don’t have any vehicles like that to send,” McCreedy said. Water Transport, of Hopedale, Ohio; Zemba Brothers, of Zanesville; and Tadpole’s Water Hauling, of Chillicothe, are some of the companies noted to be participating in the emergency water transport. McCreedy said the smallest of trucks carries about 2,000 gallons of water while the largest can carry up to 6,500 gallons. He also said the last of the trucks to have hauled water (as of the publishing of this story) was about 8 a.m. Thursday. McCreedy said the transported water was potable, but he was unsure if the water was needed by the Toyoya facility for drinking purposes or plant operation. McCreedy said Gallipolis city water runs about 70 cents per 100 gallons. Nearly 182,000 gallons have come out of Gallipolis since trucks started moving water from the town plant. The total cost of water will equate to nearly $1,274. The water plant supervisor noted that the real expense in water transportation came from man hours worked, overtime, trucking employee costs and fuel costs. According to published reports, West Virginian American Water anticipates working around the clock to have water services returned to satisfactory conditions as quickly as possible. Boil orders have been posted around the Charleston area, and a variety of water distribution sites have been established for those who need it. The Toyota plant in Buffalo is known to manufacture four- and six-cylinder engines and transmissions. In early January 2014, a Freedom Industries facility had a chemical spill in the Elk River, a tributary of the Kanawha River. The event happened upstream from a main West Virginian American Water intake and distribution facility. Residents in the past have complained that the spill affected Gallipolis’ water quality by traveling into the Ohio River. A little more than a year ago, Gallipolis experienced it own water emergency as pipe break beneath the city disrupted service to residents and businesses for about a week. During that time, the city received fresh water from outside sources all across the region.